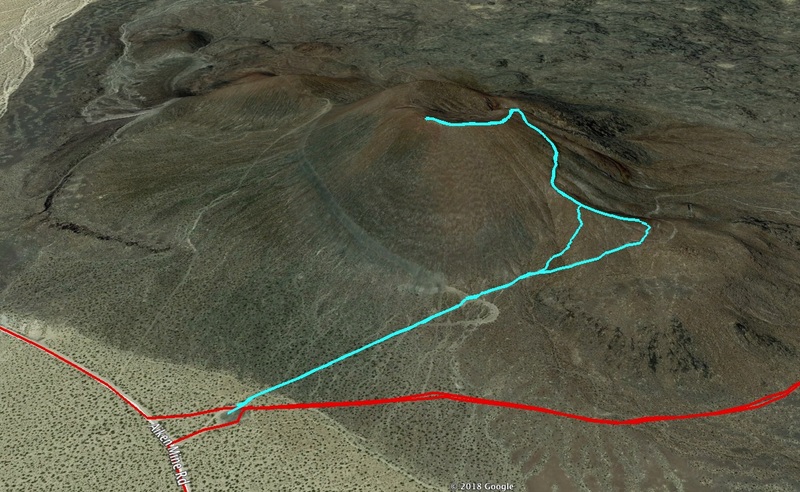 Yesterday I hiked the tallest of the cinder cones in the lava field I've been exploring. Sitting just off Aiken Mine Road in the Mojave National Preserve, this cone is easy to reach with any car. Here's a google map centered on the cone. The weather was perfect: clear skies, very slight breeze, 75F at 7:30am. The USGS topo quad (Indian Spring) says the cone summit is 1187 m. It's not very tall and I reached the top after only 20 minutes. For most of the route I followed an old mining road. I took a short section off trail to shorten my hike. The vegetation helps keep the small lava rocks from sliding under your feet. The next shot looks back down at the parking area from the summit. The summit is relatively flat and covered with very jagged lava rocks. The two cinder cones in the distance are the next ones I'll hike. I plan to drive the 4wd trails there and park between the two cones. The Mojave Desert Lava Tube is just up the road so this is a nice hike to do after visiting the tube.